Today we visited Durham Fire and Ice. 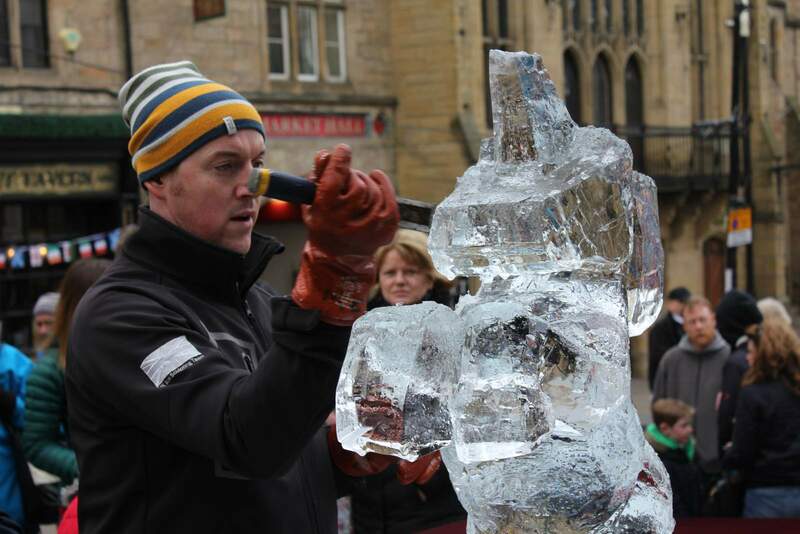 It is billed as an exciting ice sculpture trail, with street entertainers, fire breathers and live demonstrations. The evening event was being set up as we were leaving, which I’m sure was spectacular, but there was little to entertain us while we waited. The trail as a treasure hunt was interesting, but we didn’t find much in the way of street entertainers, outside of the usual Durham city buskers. We arrived on the train, and headed into the city via North Road. There we found our first ice sculpture. All the sculptures are easily spotted from afar thanks to the fire on the posts around the trail. Pretty fortunate, really, because I’d forgotten to print out the map. You can find the map by clicking here. 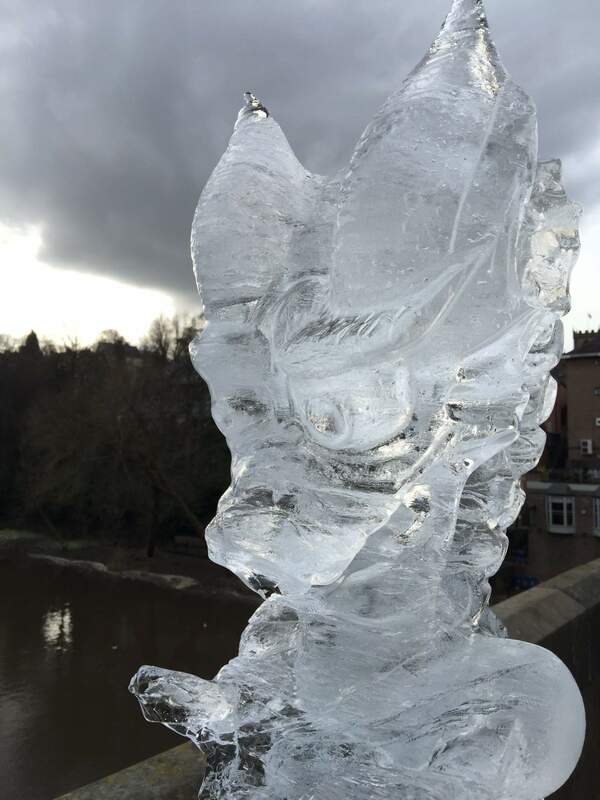 Following the path around and over the bridge towards Silver Street, you will encounter two more ice scultpures; the mermaid, and the Lambton Worm. The Phoenix is half way up Silver Street towards the Market Square, and here we had an hilarious few minutes waiting for a few little boys in a row to not pose for a photo, and then James followed suit. See if you can be a bit more successful! 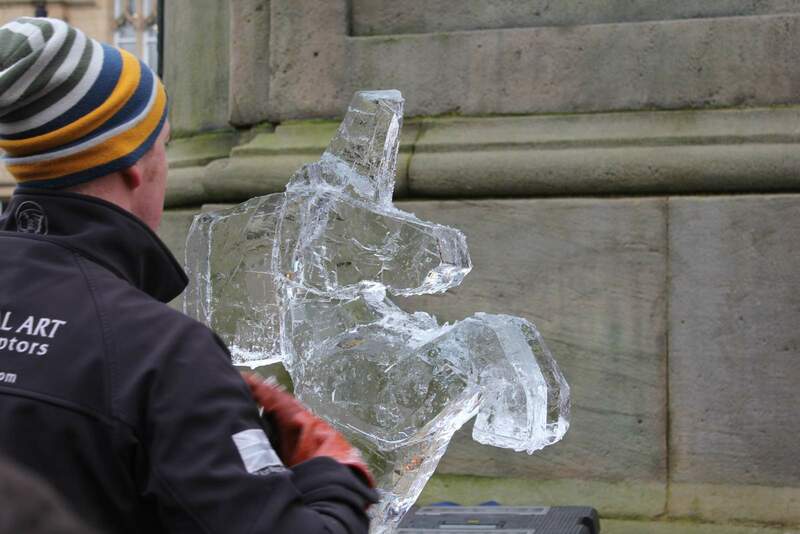 In the Market Square there was a demonstration with a man creating a unicorn from a huge block of ice. Noah was absolutely fascinated, and asked repeatedly to go back to watch the man. Here, James found a piece of ice, which he nursed for the rest of the trail. I’ll just show you how excited he was to find that piece of ice – imagine! 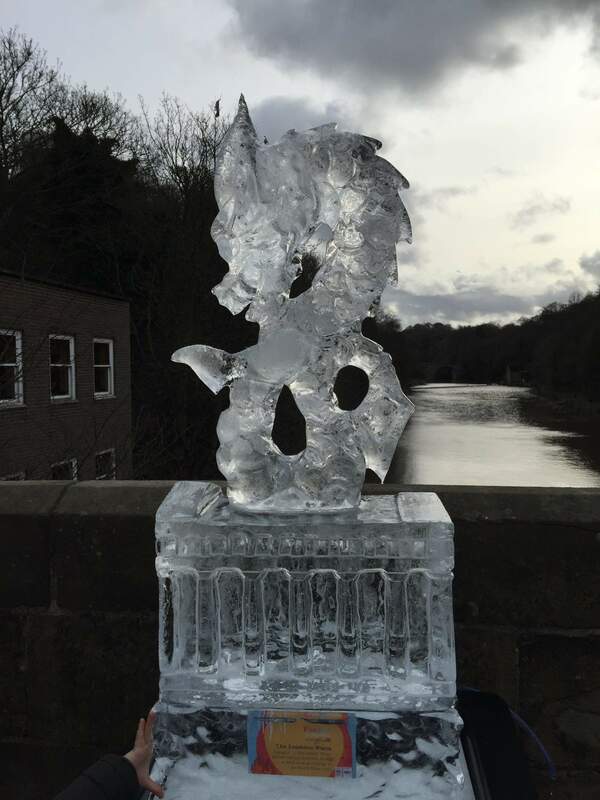 Ice at the Durham Fire and Ice! Haha; I love what they find to spark their imaginations. 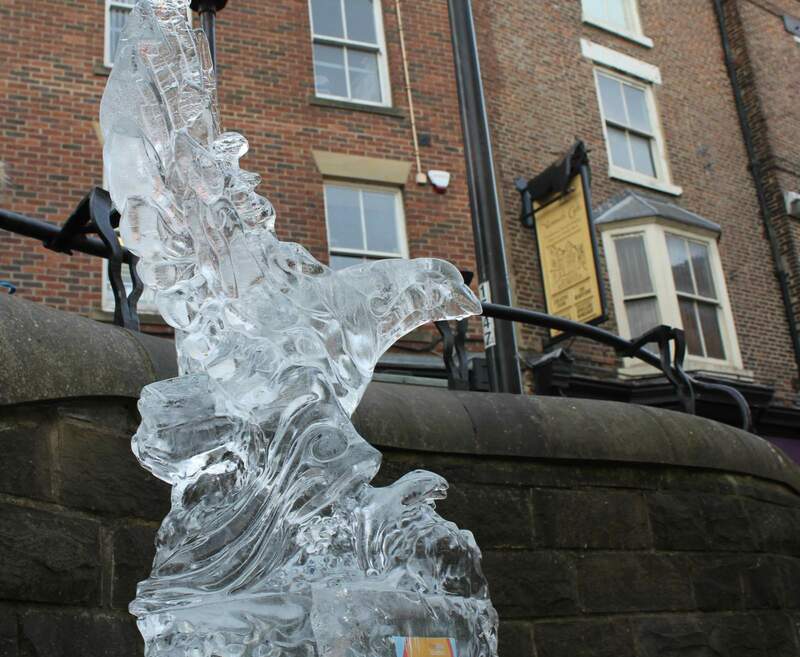 We headed along to Elvet next, with three sculptures to spot. The first was the competition winner, and it has amazing detail and somehow different colours of ice inside. 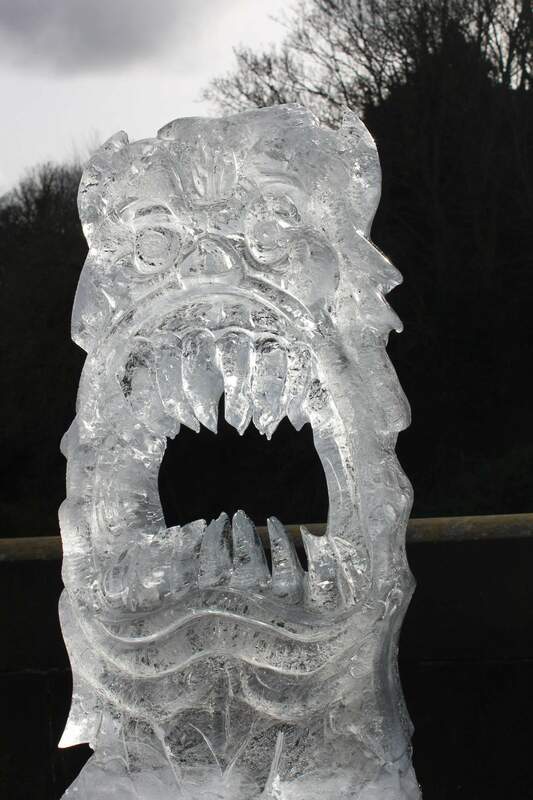 The other ice sculptures are all worth a look. It really won’t take much time to see the whole trail, even with 30 minutes of waiting for a go at the ice sculpting as we did. Unfortunately I had stopped to watch the demonstration, and James had spotted some children having a go too. So he sort of hovered around next to them, and I was too wrapped up in getting Noah a snack and helping him to drink without tipping it all over him. Anyway, after a little while I realised there was actually a queue and we weren’t in it. 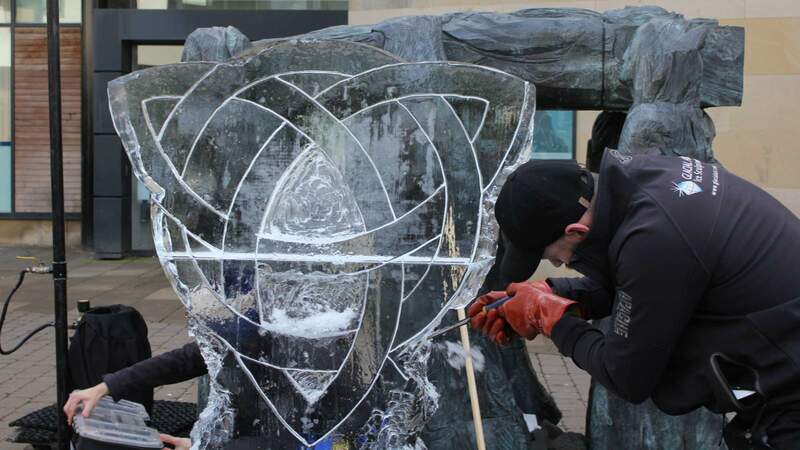 We moved around to join the long line of people waiting for their children to have a go at ice sculpting with the pro, and then word spread around the queue that you have to be aged 7 or above because the tools are really sharp. The lady behind me went over to enquire if her 5 year old would be able to have a go, and they said that they would make an exception. I asked James if he wanted to be 5, to which he replied “No! I’m 4!” so we decided we’d go home freeze some water to make our own chocolate ice block. The chocolate ice block in the Fire and Ice trail was a bit of a disappointment. It was quite small for the huge gaggle of children trying to have a go at getting the chocolate out of the block of ice. Some children had spoons, others had their parents’ keys, while others were chipping away at the ice with stones. Randomly there were some wrappers hanging out of the ice at different points, where someone had managed to get the chocolate half out of the ice, and while we were there we couldn’t find any bars that would have been out very soon. 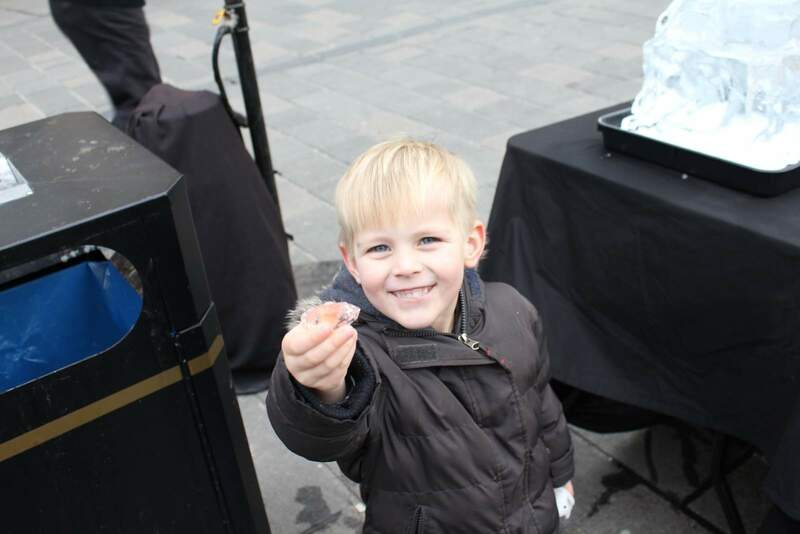 Nearby there is the chance to win £40 of vouchers if you manage to pull the sword from the ice block. James had a good go, but said that he would’ve tried harder if he’d known there was a prize. We left before the evening entertainment was ready. In all, we spent 1.5 hours in Durham today. We saw a few pieces of the ice sculptures twice, and they are brilliant pieces of art, but it won’t take you a long time to get around the trail; don’t go thinking that you’ll be there all day. It is easy to find all the pieces around the Durham Fire and Ice. We took the pushchair and it was totally fine. Be aware that Durham is mostly cobbled and so it might be a bit of a bumpy ride for your little one if you have small wheels or very little suspension. Overall it was good for a run around, and to spot the ice sculptures along the trail, but I don’t think it was as brilliant for toddlers or preschoolers as it might have been. 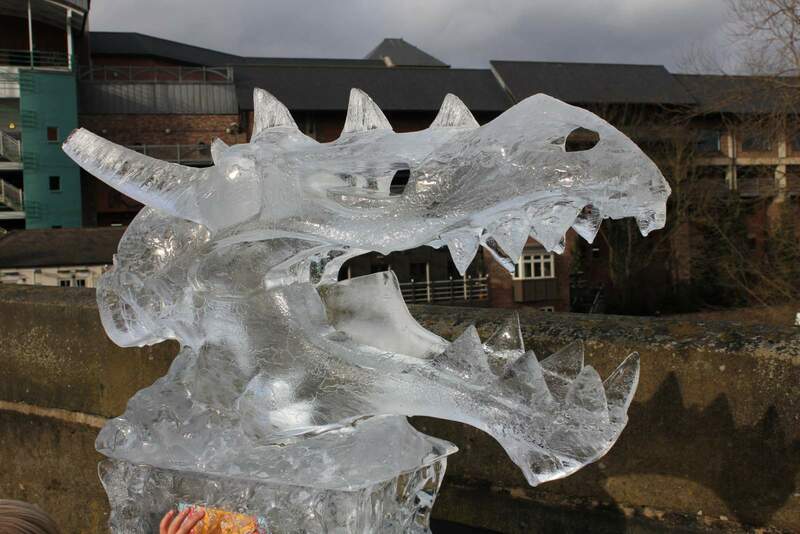 Have you been or are planning to visit Durham Fire and Ice 2017? Let me know what you thought! We never made it as so busy! Looks fun but not sure if the girls would have been that excited by them. they would have probably enjoyed the show though!